^ "Twitter Devolutions". Foreign Policy. Archived from the original on 7 October 2016. Retrieved 2016-10-27. ^ "Egypt dissolves former ruling party". Al Jazeera English. 2011-04-16. Archived from the original on 16 March 2011. Retrieved 2016-07-01. ^ "Kingdom a country of moderate Islam". Saudigazette. 2017-10-24. Retrieved 2018-03-26. ^ Rice-Oxley, Mark (2011-03-21). "WikiLeaks cable links defecting Yemeni general to smuggling rackets". The Guardian. ISSN 0261-3077. Retrieved 2019-02-27. 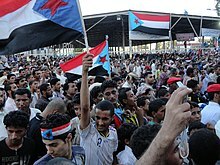 ^ "Feature-South Yemen separatists find hope in spreading unrest". Reuters. 2011-03-02. Retrieved 2019-02-27. ^ "Yemen: The tie that binds". Public Radio International. Retrieved 2019-02-27. ^ a b Kausch, Kristina (2009). 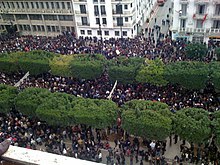 "Morocco: Smart Authoritarianism Refined". In Emerson, Michael; Youngs, Richard. Democracy's Plight in the European Neighbourhood: Struggling Transitions and Proliferating Dynasties. Brussels: Centre for European Policy Studies. pp. 140–147. ISBN 9789290799269. ^ a b "Tunisia Overview". www.worldbank.org. Archived from the original on 9 October 2016. Retrieved 2016-10-27. ^ Acemoglu, Daron; Johnson, Simon; Robinson, James (4 January 2006). "Institutions as a Fundamental Cause of Long-Run Growth". In Aghion, Philippe; Durlauf, Steven N. Handbook of Economic Growth, Volume 1A. North-Holland. pp. 385–472. ISBN 9780444520418. Aa. Vv. (2011), The New Arab Revolt: What Happened, What It Means, and What Comes Next, Council on Foreign Relations, Foreign Affairs, Maggio-Giugno. Abaza, M. (2011), Revolutionary Moments in Tahrir Square, American University of Cairo, 7 May 2011, www.isa-sociology.org. Abdih, Y. 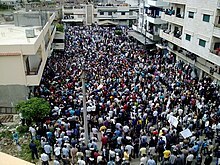 (2011), Arab Spring: Closing the Jobs Gap. High youth unemployment contributes to widespread unrest in the Middle East Finance & Development, in Finance & Development (International Monetary Fund), Giugno. Anderson, L (May–June 2011). 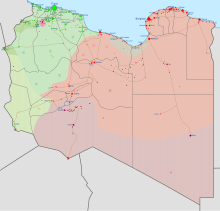 "Demystifying the Arab Spring: Parsing the Differences between Tunisia, Egypt, and Libya". Foreign Affairs. 90 (3). Beinin, J. – Vairel, F. (2011), (a cura di), Social Movements, Mobilization, and Contestation in the Middle East and North Africa, Stanford, CA, Stanford University press. Brownlee, Jason; Masoud, Tarek; Reynolds, Andrew (2013). The Arab Spring: the politics of transformation in North Africa and the Middle East. Oxford: Oxford University Press. Browers, Michaelle (2009). Political Ideology in the Arab World: Accommodation and Transformation. New York: Cambridge University Press. ISBN 978-0-521-76532-9. Cohen, R. (2011), A Republic Called Tahrir, in New York Times. Darwish, Nonie (28 February 2012). The demon We Don't Know: The Dark Side of Revolutions in the Middle East. John Wiley & Sons. Davies, Thomas Richard (2014). "The failure of strategic nonviolent action in Bahrain, Egypt, Libya and Syria: 'political ju-jitsu' in reverse" (PDF). Global Change, Peace & Security. 26 (3): 299–313. doi:10.1080/14781158.2014.924916. Gardner, David (2009). Last Chance: The Middle East in the Balance. London: I.B. Tauris. ISBN 978-1-84885-041-5. Gause, F. G. (2011), Why Middle East Studies Missed the Arab Spring: The Myth of Authoritarian Stability, in Foreign Affairs, July/August. Goldstone, Jack A.; Hazel, John T., Jr. (14 April 2011). 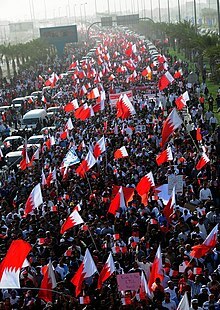 "Understanding the Revolutions of 2011: Weakness and Resilience in Middle Eastern Autocracies". Foreign Affairs (May/June 2011). Haddad, Bassam; Bsheer, Rosie; Abu-Rish, Ziad, eds. (2012). The Dawn of the Arab Uprisings: End of an Old Order?. London: Pluto Press. ISBN 978-0-7453-3325-0. Kaye, Dalia Dassa (2008). More Freedom, Less Terror? Liberalization and Political Violence in the Arab World. Santa Monica, CA: RAND Corporation. ISBN 978-0-8330-4508-9. Ottaway, Marina; Choucair-Vizoso, Julia, eds. (2008). Beyond the Façade: Political Reform in the Arab World. Washington, DC: Carnegie Endowment for International Peace. ISBN 978-0-87003-239-4. Pelletreau, Robert H. (24 February 2011). "Transformation in the Middle East: Comparing the Uprisings in Tunisia, Egypt and Bahrain". Foreign Affairs. Phares, Walid (2010). Coming Revolution: Struggle for Freedom in the Middle East. New York: Simon & Schuster. ISBN 978-1-4391-7837-9. Posusney, Marsha Pripstein; Angrist, Michele Penner, eds. (2005). Authoritarianism in the Middle East: Regimes and Resistance. Boulder: Lynne Rienner. ISBN 978-1-58826-317-9. Roberts, Adam, Michael J. Willis, Rory McCarthy and Timothy Garton Ash (eds. ), Civil Resistance in the Arab Spring: Triumphs and Disasters, Oxford University Press, Oxford, 2016. ISBN 978-0-19-874902-8. Arabic language edition published by All Prints Publishers, Beirut, 2017. ISBN 978-9953-88-970-2. Steinitz, Chris and McCants, William (2014). Reaping the Whirlwind: Gulf State Competition after the Arab Uprisings. Arlington, VA: CNA Corporation. Struble Jr., Robert (22 August 2011). "Libya and the Doctrine of Justifiable Rebellion". Catholic Lane. Tausch, Arno (2015). Globalization, the environment and the future "greening" of Arab politics. Connecticut: REPEC. Tausch, Arno (Fall 2013). "A Look at International Survey Data About Arab Opinion". Middle East Review of International Affairs. 17 (3): 57–74. SSRN 2388627. Tausch, Arno (Spring 2016). "The Civic Culture of the Arab World: A Comparative Analysis Based on World Values Survey Data". Middle East Review of International Affairs. 20 (1): 35–59. doi:10.2139/ssrn.2827232. SSRN 2827232. United States. Congress. Senate. Committee on Foreign Relations. Subcommittee on International Operations and Organizations, Human Rights, Democracy, and Global Women's Issues. (2012). Women and the Arab Spring: Joint Hearing before the Subcommittee on International Operations and Organizations, Human Rights, Democracy, and Global Women's Issues and the Subcommittee on Near Eastern and South and Central Asian Affairs of the Committee on Foreign Relations, United States Senate, One Hundred Twelfth Congress, First Session, November 2, 2011. Washington, D.C.: U.S. G.P.O. Amanda Jacoby, Tamil (2013). "Israel's relations with Egypt and Turkey during the Arab Spring: Weathering the Storm". Israel Journal of Foreign Affairs. VII (2): 29–42. doi:10.1080/23739770.2013.11446550.